WW2 Jeep - perfectly restored! 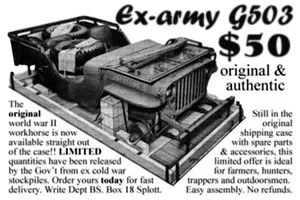 The US Army Willys and Ford 'Jeeps' are a great vehicle to own and are often the first ex-army vehicle that many military hobbyists get to buy. Their relatively small size means that they'll fit in a single garage and the cost of those all-important spares is not too high. 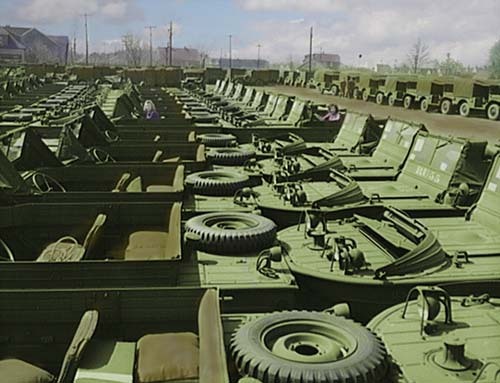 Interest in military vehicles is as high as it's ever been and the demand for spares and accessories means that just about every part is available and easy to find thanks to the web. When you drive a WW2 Jeep, you realise how insulated from the outside world you are in a modern car. With the hood and windscreen down, it feels more like you are sitting on top of the vehicle rather than in it. The jeep is very 'hands on' and needs input all the time. It lets you know this with a level of feedback that you just don't get in a power steering, air conditioned, seat-cushioned, sound-proofed modern car. Start the engine (by pushing a button with your foot) and after releasing the handbrake (in the dash) you start off in first gear (where second is usually!). You get road noise from the tyres, the engine makes a loud whining sound, everything vibrates and rattles and you feel every bump and pothole through the steering wheel. People wave and smile at you - even in England! The side valve power plant, the 2.2 litre, 4 cylinder 'Go-Devil' engine is (comparatively) economical and like the rest of the jeep is easy to fix. Compared to a modern car, the jeep is simplicity itself to work on as everything was designed for ease of access and replacement. There's loads of room in the engine bay, you can crawl underneath it to fix things and as long as you are a reasonable competent home mechanic or hobbyist, you'll find that there are not many jobs that you can't cope with. 1944 Willy's MB . For sale - see below. Work as a Film Extra - You can earn £60-150 a day and more working as a film extra or background performer/artist. Extra payments for using firearms, wearing uniform etc. It's not as glamorous as it sounds and you're unlikely to get rich but it can make for an interesting couple of days and you might get to see your favourite stars up close. Many re-enactors of everything from the Civil War to World War 2 have appeared in films. You'll need to supply good quality head and shoulders and full-length photographs, a short CV plus full details of height, weight, and all your clothes sizes. 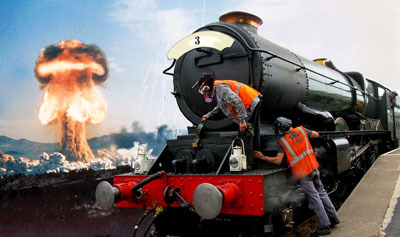 The Strategic Steam Reserve - Myth or Reality? The site is no longer accepting new for sale and wanted listings as of 2014. We've left the last ads up for info and to help with an idea of pricing. comments 1953 Willys M38 A1 for sale.Nice original condition with minimum age related wear and tear, this jeep looks proper and fantastic when driven around. Starts,runs and drives like it should.Owned and looked after by a high ranking Officer,now retired to U.S.A.this Willys has spent all its life in the warm South Pacific,I imported it last year-all Customs etc,. paperwork completed-and used and enjoyed it through the Summer -fantastic! New canvas hood ordered. Sherman radial engines in very good condition . One is already sold to a museum in the USA but the other is still available . It is 100 % complete except the carburetor , including clutch , mount , exhaust sistem etc . The engine has the spark pluggs , hoses and conection placed what preserved the inner parts of it . We are selling it at $18000 . These engines are in the same condition they were removed 35 years ago when the Argentine Army exchanged them by the V-8 French diesel Poyaut . That´s why they are 100 % complete . I´m attaching some pictures . I always like to inform everybody about the new stuff available and give the same oportunity to buy this hard to find items . Professionally restored to new condition. In perfect working condition. Many accessories included. California registered and street drivable. comments 1943 Ford GPW . A new vehicle to the UK. Vehicle has a good chassis, the body tub, has the usual rust problems (floor), parts are easily available to repair this. The engine runs fine, the gearbox and transfer box appear to function as they should. It does look like there is some original markings under the years of paint. The vehicle will be sold with all documents (US Title) and the (customs proof of payment) C&E 386 to prove that all duties have been paid. I am happy to help send the vehicle any where, I have a car trailer for hire if assistance is needed to move the vehicle in the UK. Please call for an appointment to view or e mail for more details. comments 1950 USN JEEP IN EXELENT CONDITION; NO DENTS, RUNS GOOD, MOST OF IT'S LIFE SPENT IN A WAREHOUSE. JEEP HAS BEEN TOUCHED UP OVER THE YEARS BUT PAINT STILL LOOK'S FAIR, WITH SOME SUPERFICIAL RUST; AFTER ALL IT'S 63 YEARS OLD. I CAN POST PICTURES IF NEEDED. comments Have a 1942 Ford GPW that I bought to rebuild. All of the sheet metal was off when purchased it but is all here and is stored, body is rough but hood, fenders ect are in good shape. I rebuilt the all of the running gear, brakes, sand blasted and painted the frame, I just got too old and lost interest and I want to sell it. All of the other parts and pieces are here and stored. I paid $2,800 for it before the rebuilding. The price includes car without bazuka. A line up of Amphibious Jeeps or 'Seeps' as they are sometimes known. This is a very nice accurate depiction of an SAS jeep as seen in the North African campaigns of 1940-43. The jeep is a Ford, 1942, it has many complete period accessories including a 30 cal (gas firing gun) a drivers mounted (gas firing) Bren gun and a pair of Vickers K guns(repro). War time dated jerry cans, theodolite, period tent, shovel etc. Willy's/Ford Jeep - The first Jeeps to arrive in the North African theatre were those issued to Stirling's SAS (which had relied on LRDG transport until they were equipped with their own Jeeps in early 1942). After the SAS had to abandon some Jeeps in the desert, these were salvaged and repaired by LRDG patrols; soon after, all patrols were equipped with their own Jeeps as replacements for the 15cwt Chevrolets. The legendary desert performance and reliability of the Jeeps made them ideal for LRDG patrols. Some of LRDG's Jeeps were later used in the Balkan and in Italy (where the patrol trucks were of little use). The jeeps were stripped of all non-essential parts including the windscreen, most of the radiator grille bars and even sometimes the front bumper to increase the effective load carrying capacity of the vehicle. Thus the large amount of fuel and water needed for fast long-range raids could be carried avoiding the need for slower support vehicles. A water condensing unit was fitted to the front to reduce loss from the radiator which would otherwise have had to be topped up from the limited drinking water supplies. The jeeps also carried sand mats, metal wheel channels, radio equipment and large quantities of ammunition. The jeeps were heavily armed with combinations of both Browning and Vickers K machine guns. The ex-aircraft Vickers weapons were generally mounted in pairs and a total of up to five machine guns were carried on some vehicles. The effectiveness of this armament firing a mix of ball, armour-piercing and tracer shells can be judged from one assault on an airfield where 12 aircraft were destroyed in a five minute raid. With all guns blazing a single SAS jeep could deliver an impressive 5000 rounds per minute! The net result was that over 400 aircraft had been destroyed on the ground by November 1942.
comments 1944 Willys MB Jeep. Older restoration but still in good condition with a New canvas top and brand new US Military Tires. Original US Jerry Can and tools, side mounted .30 machine gun support and original tow bar on the front. Rear sides and front side doors are also available. A good Willys Jeep for little money. Comes with the correct 1944 Willys MB registration documents. The UK world war II jeep, Willys jeep, Willys MB, Ford GPW, slatgrill jeep and Austin Champ site - best for UK jeep UK info etc...All this and world war 2 jeeps 4 sale - A quick history of the military jeep, where to find those elusive jeep spares and jeep accessories and online info on army surplus, gifts and jeep memorabilia and souvenirs. We don't carry jeep for sale adverts any more but the old ones have been archived (minus the contact information) here as a price guide and reference .